There are lots of issues and problems that bother everyday user of Outlook. There is a unique error mentioned in one of the forums about an individual having trouble with the OST file. It mentioned a message that pops up saying ‘Outlook.ost has reached its maximum size.’ It happened every time he tried to open and access his Outlook profile. It went on to suggest deleting some items. This was not possible as most conversations in the mailbox were important and deleting some did not fix the issue. This post will shed some light on this issue and explore it a little further. It talks about the reasons causing the problem and fixing it. Most of the steps mentioned here are quite easy and can be followed by any normal user. Repeat them precisely as mentioned here to avoid data loss. File Size Limitation: The earlier versions of Outlook 2002 used ANSI format which had the size limitation of about 2GB. It was filled in a few months time when communicating with large attachments. 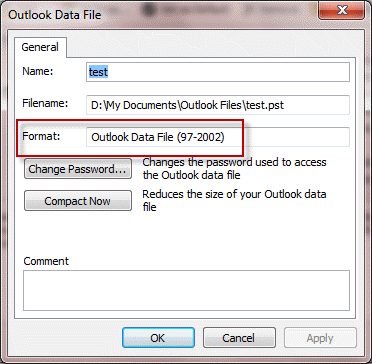 Threshold Limit Approaching: In the later versions of Outlook 2007, 2010, UNICODE format was used with limit 20GB. This too was filled with regular use causing OST size issues. Change in Registry Entry: Installing two different versions of Office like Outlook 2007 and 2013 on the same machine may lead to errors. Some registry entries might not update properly leading to OST errors. To begin, go to Start>>Control Panel>>Mail and click on Data Files button. 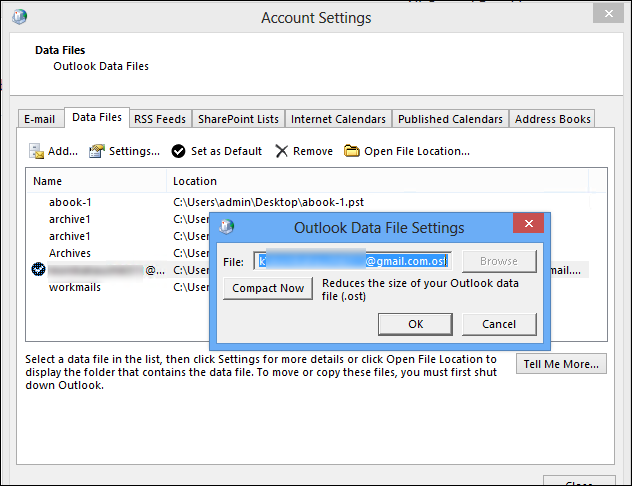 Then, double-click on the Outlook file having Outlook large mailbox problem. If it shows “Outlook Data File” or “Personal Folder” it is UNICODE-type PST file. If it shows “Personal Folders File(97-2002)” or “Outlook Data File(97-2002)”, it indicates as ANSI-type PST file. 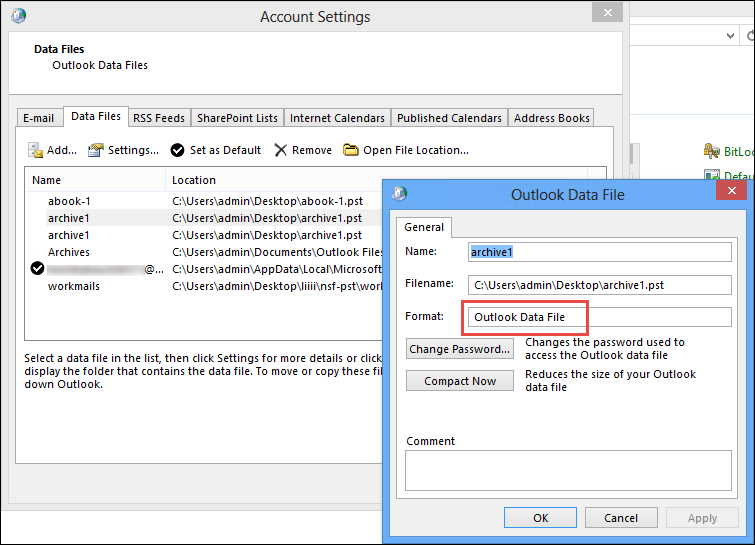 If it is an ‘Outlook Data File Settings’ box then, OST file is being used for the IMAP account. First, go to Tools>>Folder Options>>View tab and mark the button for ‘Show hidden files’. Click on ‘Alt’ key if there is no toolbar in Windows 7 PC. In Windows 7 or Vista, go to C:\Users\User\AppData\Local\Microsoft\Outlook\ to repair Outlook.ost data file. Check the file size of each OST and PST file. Determine which of these is reaching its threshold limit. Create a new profile with the same account with new PST file. This will remove any PST file size errors. To remove large OST file issues, disable the ‘Cached Exchange Mode’. Then, rename the Outlook.ost file and restart Outlook. Next, enable Cache Mode and now a new .ost file will be created. It will sync all mailbox data directly from the server. There is a near perfect tool to make the issues and bugs disappear from Outlook.ost file. It is to use the OST recovery tool. It can work with any version of Outlook 2002, 2003, 2007, 2010, 2013 and 2016. It is super user-friendly and has an Outlook-like appearance which can be used by any technical or non-technical individual. It can split converted PST file into smaller parts. It even converts Exchange Server OST to free some space on the IMAP server. The mailbox errors become quite frequent if the OST file is reaching its threshold level. It can even prevent access to the mailbox at a certain point and restrict communication. To avoid such a scenario, use the manual suggested in this post or go for the better alternative. Use the tool mentioned in the post to repair, recover, split and convert all in few steps. It can even fix the issue ‘Outlook.ost has reached its maximum size’.